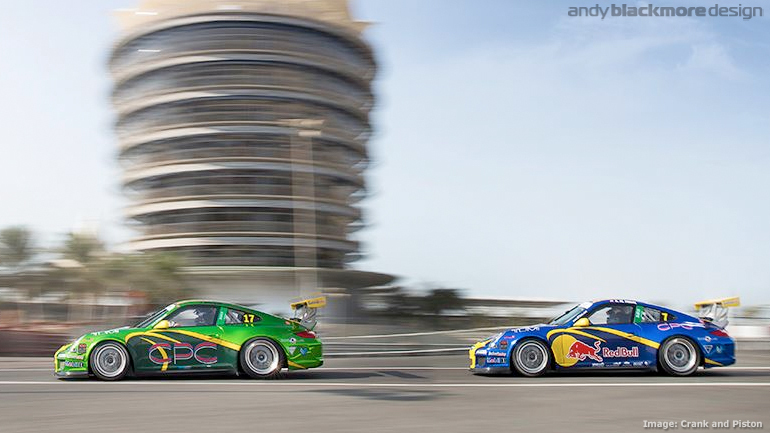 I was originally contacted by the Saudi Falcons via some previous work with Schubert Motorsport . 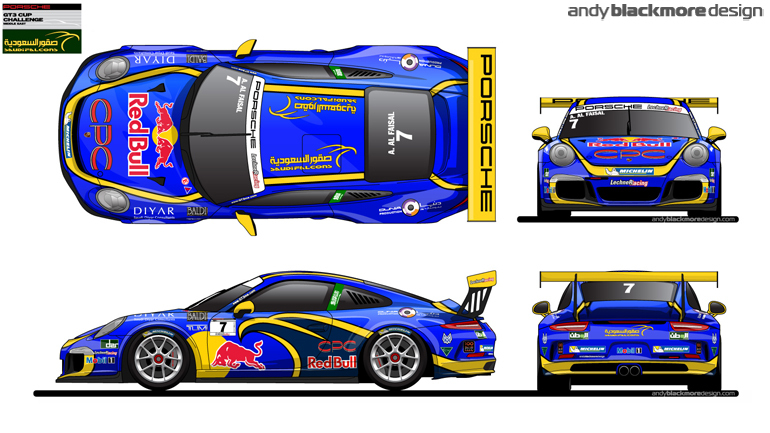 The organisation commissioned me to design an all new livery for the 2012/2013 season. The first car to be tackled would be the team’s Porsche 911 GT3 Cup car which competes in the Middle East GT3 Challenge. Knowing this had to work across Single seaters, Prototypes and GT cars, I needed to ensure the bodywork of the Porsche didn’t direct the design. My previous trip to Dubai for the 24Hrs reminded me of their awesome day break and sunsets, how strong contrasts and hues are required to penetrate through the mist and fog which sometimes hover. I like to explore and play with different materials such as the previous BMW Z4 GT3 race-cars with unpainted Carbon and a Polygon mesh from a video game, or the Matt and Gloss of the Mustang RTR-X. Add to the tuner culture in the middle east and I started to explore chrome finishes. We tried a few ideas and the team even mocked up a couple of variations(!) before we settled on a chrome base with Solid and Yellow accents. Introducing the Solid Green into the Falcon graphic on the side allowed it to stand out and make a statement. 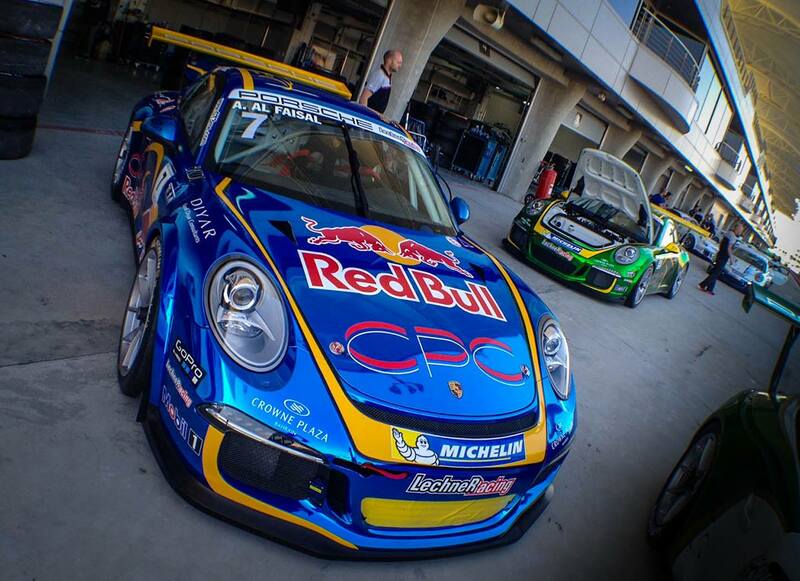 The sister car, driven by His Highness, Abdulazia Turki Al Faisal had sponsorship from Red Bull. 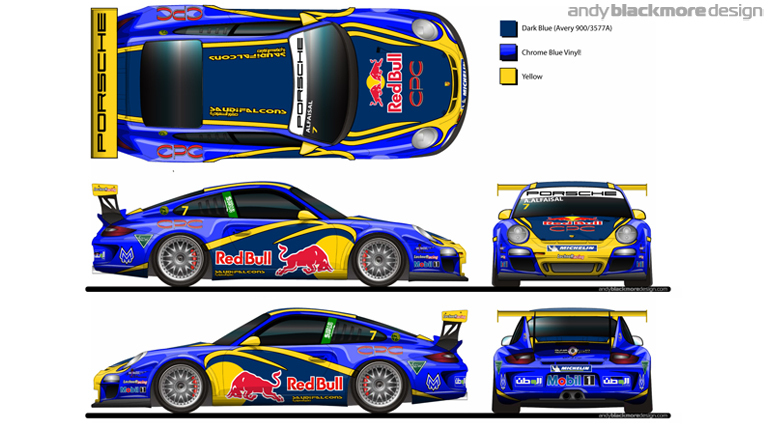 Red Bull insisted on their logo on the solid blue, which worked out perfectly. 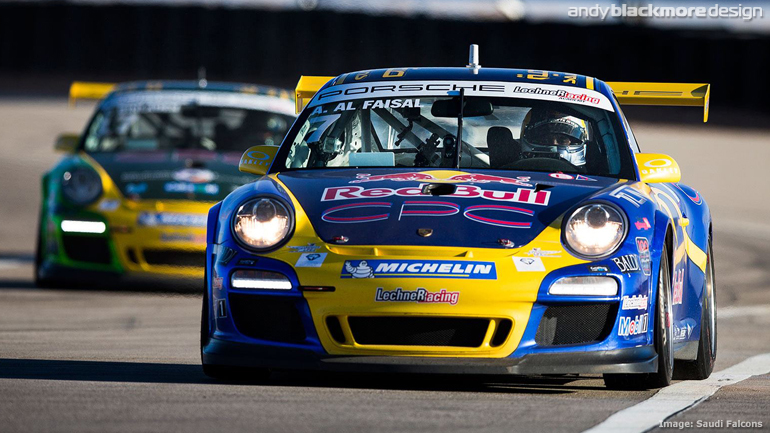 The Porsche made their debut towards the end of 2012. 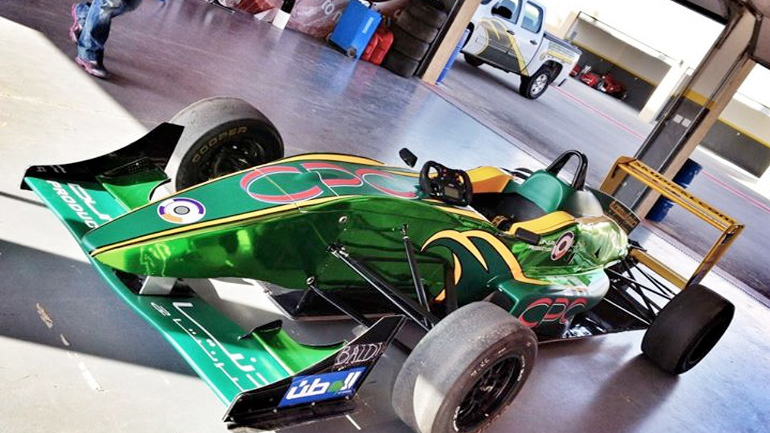 The motor racing season in the middle east runs from November-April. The design was very well received and gained extensive coverage online. I had also started to explore other vehicles inlcuding a Radical and a strange Formula Ford style single seater, which was originally a Van Dieman. We wanted to keep the same basic concept and after some time, I convinced the team to retain the expensive Chrome wrap on these less high end cars despite the additional cost. 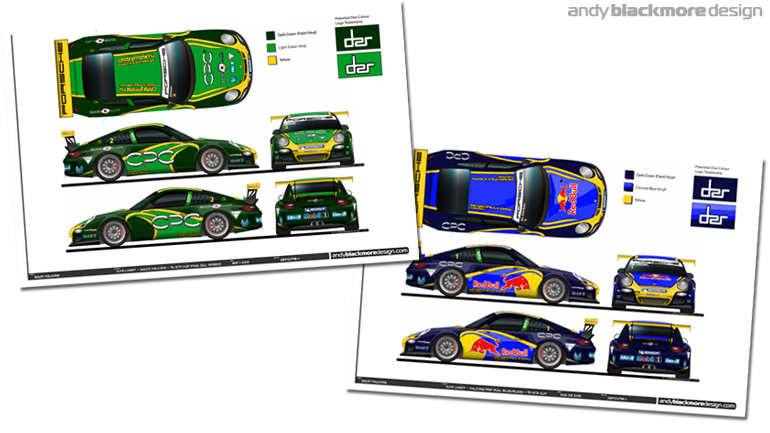 You can see in this image, I also designed a simpler livery for their support vehicles. 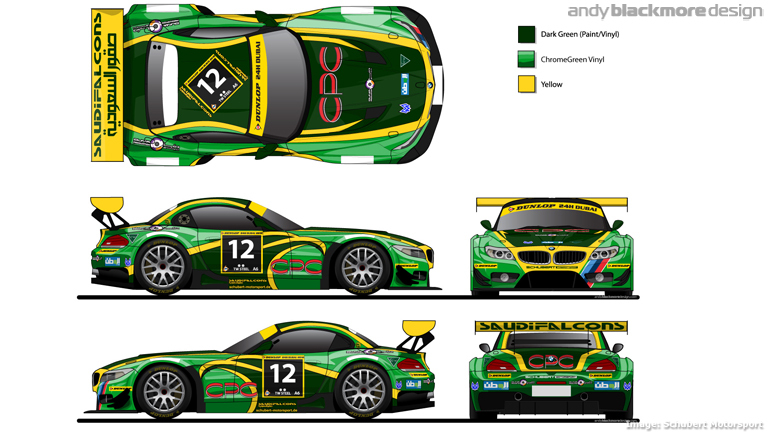 While these cars were taking to the track, I was locking down the final design for the two car BMW Z4 GT3 team which would run at the Dubai 24Hours. The same basic design, but different proportions and the requirements of an oversized number panel required a re-design. 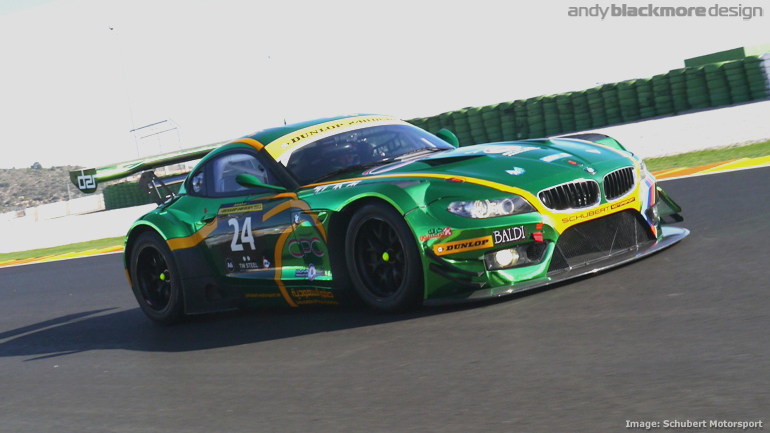 With Schubert running the factory Z4’s in Europe, we also added in the M Power graphics. 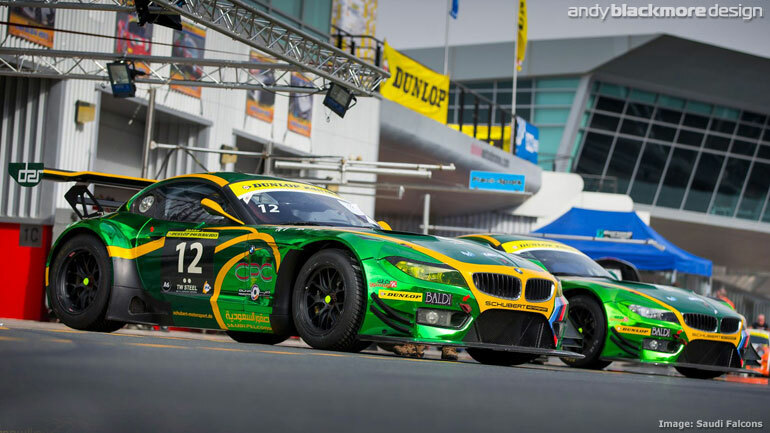 Helped by coverage from outlets such as RadioLeMans, DailySportscar, Crank and Piston and Driven, the Z4’s gained huge exposure during and after the race. While both cars led, with Claudia Hurtgen being the fastest for many hours, both cars would unfortunately retire. 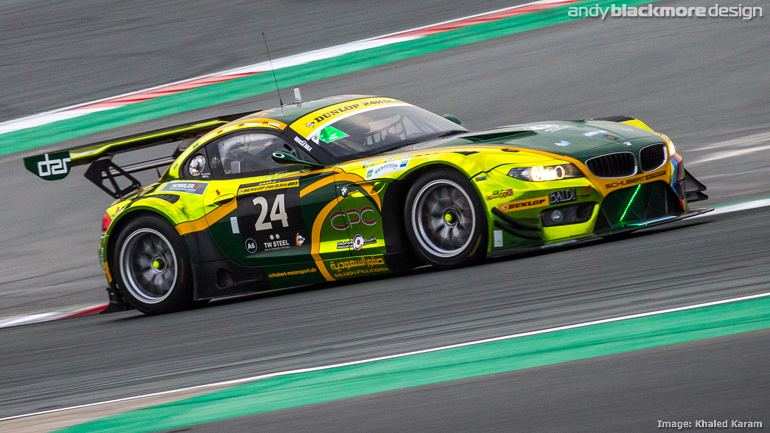 You can catch up with the 2013 Dubai 24Hrs with this stunning film from the Awesome Group, based in Dubai. 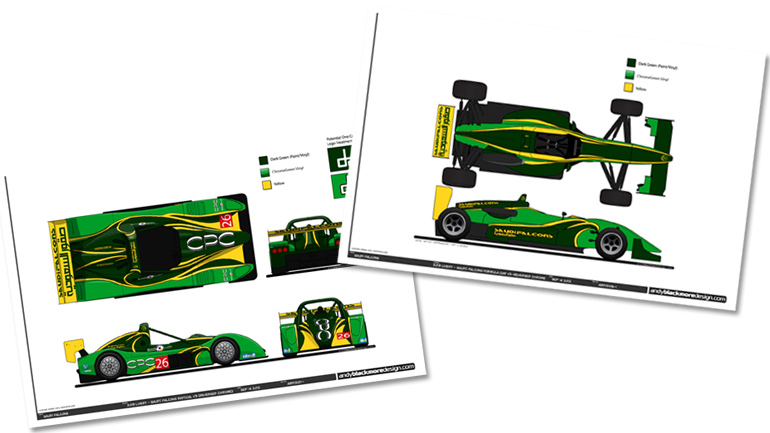 Now onto the 2014 season….. 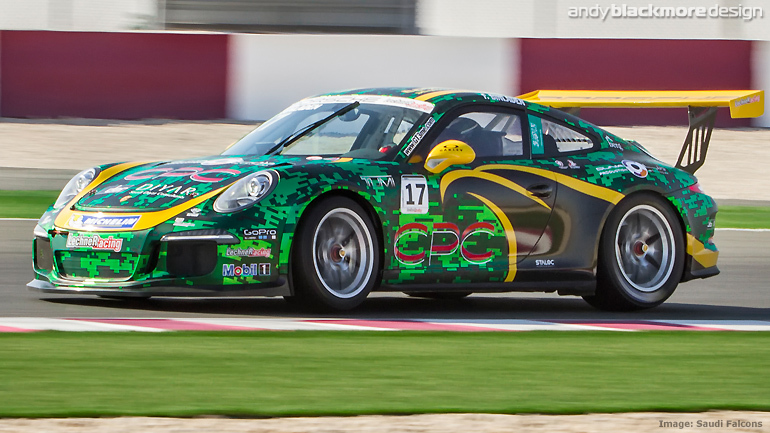 Following the success of the Chrome Saudi Falcons livery during the 2012-13 season, the livery was retained for the following season and the debut of the newnew Porsche 991 generation GT3 Cup cars in the 2013-14 Porsche 911 GT3 Challenge Middle East. 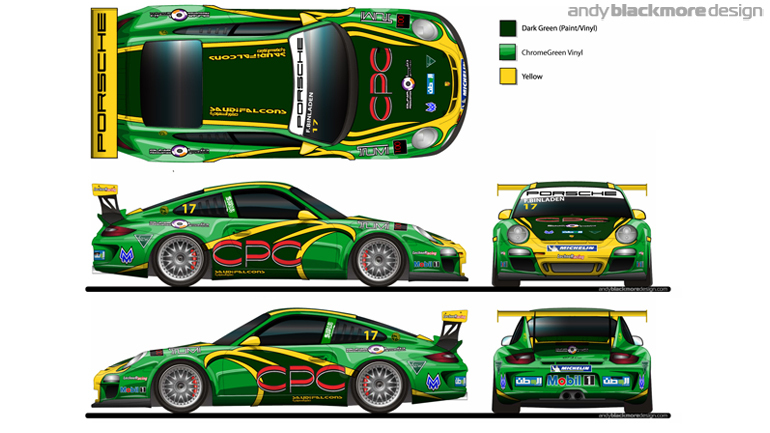 The design evolved with the Saudi Falcon graphic moved rearward on the all new car to accommodate new number panels, series branding and other sponsors. 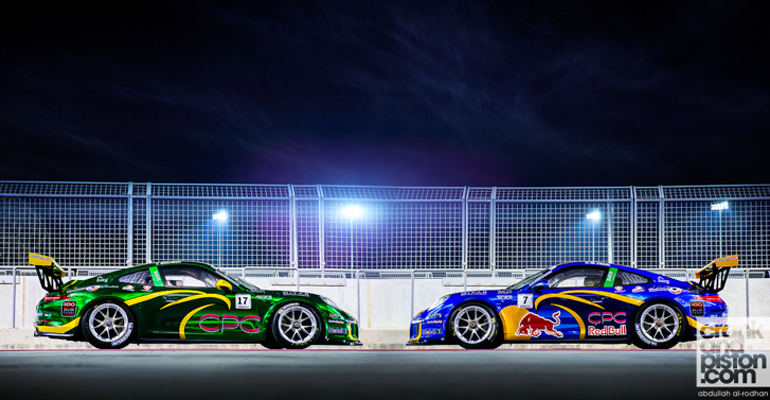 As before, the two car team ran in different colours. 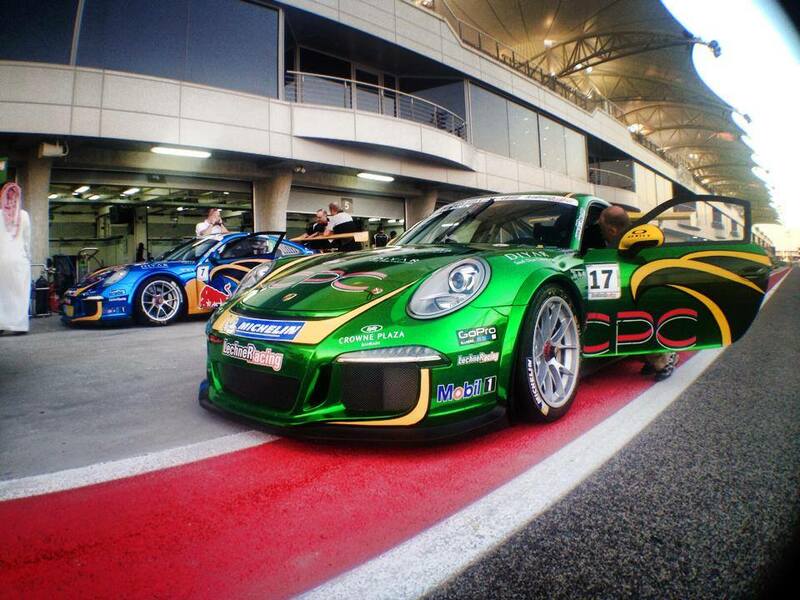 Previous Champion and Red Bull Athlete, Abdulaziz Turki Al Faisal carried the traditional ‘RB’ Blue and Chrome Blue while current Silver GT3 Challenge ME Champion, Faisal Binladen retained the tradition Green and Chrome Green associated with the Kingdom of Saudi Arabia. Check out the rest of these awesome images from Abduallah Al Rodan and Crank and Piston here. 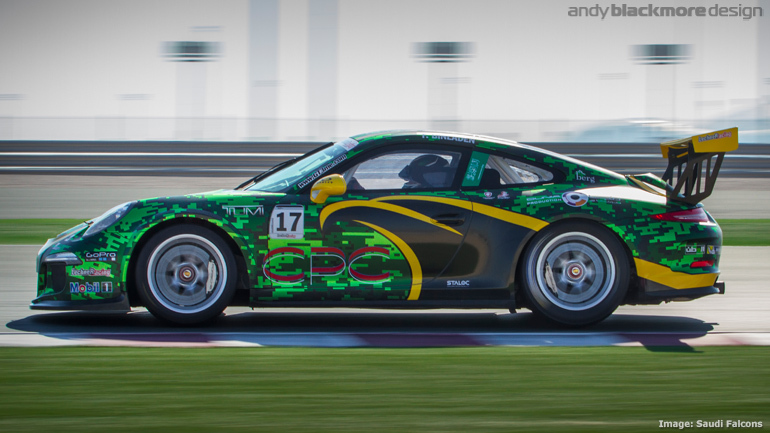 The Saudi-Falcons returned to the Porsche GT3 Challenge Middle East championship in early 2015, with 2012/3 ‘Silver’ Challenge Champion, Faisal Binladen driving a newly liveried Porsche 911 GT3 Cup race-car. For 2015, we decided to mix it up a little. 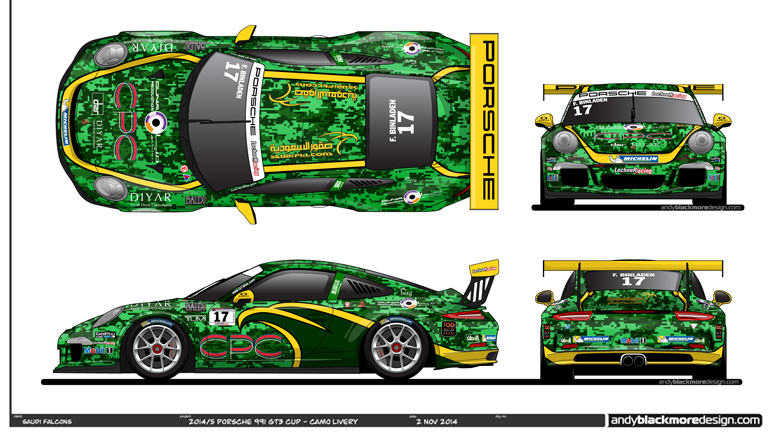 In a few short years the livery has become well known and now forms part of the team’s identity. It was important to retain the Falcon graphic, but wanted to make the 2015 stand out even more on track, given a few other teams are now following us with chrome. 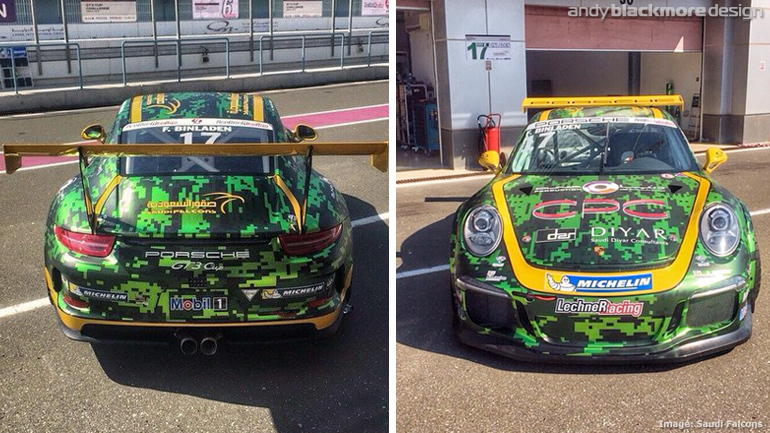 So what better way to stand out than with some Camouflage! 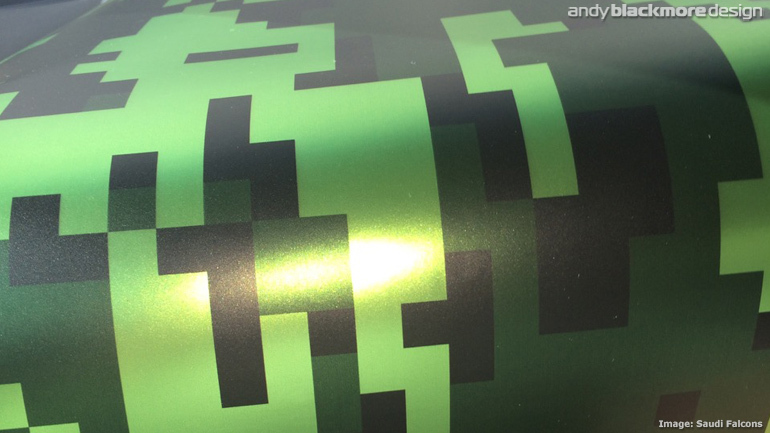 Using a Satin Chrome Green Vinyl as a base, Digital Camo is overlaid in various shades of green which freshens the look of the car while giving some cool interesting reflections from the Satin finish.